Renewing members can log in to their profiles to renew. New members, please use the application form below to join. Your membership renewal date will be: 1 Jul 2020 No automatically recurring payments Regular Membership is open to any person who meets one or more of the following criteria: ◾Certified or licensed for the practice of school psychology by the Colorado Department of Education or is eligible for such a credential; ◾Actively engaged in the practice of school psychology; ◾Trained in that field but functioning as a supervisor or consultant for school psychologists; ◾Primarily engaged in providing college or university training for school psychologists; ◾Retired from the practice of school psychology. Regular Members are entitled to vote and hold office. Your membership renewal date will be: 1 Jul 2020 No automatically recurring payments Associate membership is open to persons who are engaged in a closely related field of education or mental health, and are not eligible for Regular Membership. Associate Members are not entitled to vote or hold office. 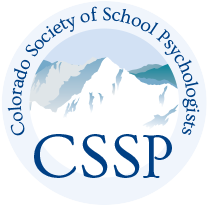 *NOTE: All CSSP Associate memberships correspond to the fiscal year and expire June 30. Your membership renewal date will be: 1 Jul 2020 No automatically recurring payments Early Career School Psychologist Membership is open to any person who is within three (3) years of graduation from a school psychology graduate training program; AND meets one or more of the following criteria: ◾Actively engaged in the practice of school psychology; ◾Certified or licensed for the practice of school psychology by the Colorado Department of Education or is eligible for such a credential; ◾Actively engaged in the practice of school psychology; ◾Trained in that field but functioning as a supervisor or consultant for school psychologists; ◾Primarily engaged in providing college or university training for school psychologists; Early Career Members are entitled to vote and hold office. *NOTE: All CSSP Early Career memberships correspond to the fiscal year and expire June 30. Your membership renewal date will be: 1 Jul 2020 No automatically recurring payments Student Membership is open to persons who are enrolled in graduate-level training programs for school psychologists and are not employed as a school psychologist on a full salaried basis. Student members are entitled to vote but shall not hold elective office.